Just imagine yourself waking up in the early morning at the beach. There is that sound, the constant hum of the ocean just a few blocks away. The birds are awake too as they prepare for the day. You can start the day in the bright new kitchen which is stocked with pots and pans and table ware too of course. Looking out the window you will notice that - yes - there are 10 beautiful beach pine trees. Sometimes the scent wafts into the cottage. Folks come to the beach for the sand, the sun and the fun which is exactly what Ten Pines Cottage was built for. Now that it is completely renovated and full of comfy furniture, the cottage is cute, cozy and clean with many new features. It sleeps up to six guests. Plus, you can bring Fido too. We love dogs and dogs sure do love the miles and miles of sandy beach that the surrounding area has to offer. After breakfast, how about a walk on the beach just a few blocks away. You can pick up shells, walk the driftwood, and watch the flocks of birds swoop and swirl along the surf line. Some guests spend all day discovering the thrill of mother nature. You can even drive your car right out onto the sand because we have one of the few beaches in the world where you can do that. Most drivers do fine, but be a little careful so you don't get stuck. In the afternoon, you might just want to sit and read a book sitting on our comfy furniture. The entire cabin is colorful and bright with the kind of furnishings you would expect for beach décor. At night you'll enjoy our comfy beds and nice linens. You will awake refreshed and ready to start the breakfast routine all over again. The cottage was comfortable for the 4 of us (3 adults/1 child). Short walk to the beach and close to downtown. Being able to bring our little dogs was great too. It was clean and comfortable, everything worked and for a weekend rental in the summer the price wasn't out of line with other properties. The one drawback was the lack of a useable outdoor space, but since you're at the beach it wasn't an issue. We stayed in Ten Pines Cottage for 2 nights during our first-ever visit to Ocean Shores. We brought two kids (ages 8, 11) and no pets. Based on the other options near town, which are primarily motels and hotels, Ten Pines Cottage is a good alternative. The cottage is quiet and clean, and a 5-minute bike ride to town and 2-minute car ride to park on the beach for sunset or a day of flying kites and throwing footballs on the beach. The kitchen has enough appliances, utensils and plates to cook meals, though we only had breakfast there. Our boys liked the bunk bed, and the master BR was minimal but sufficient. It'd be nice if there were some hangers in the closets for guests. The shared BA was clean and the water pressure in the shower great after as day at the beach. It'd be nice to have a screen on the BA window so it could be left open for ventilation. The TV channels were minimal, but the hi-speed Wi-Fi was a pleasant discovery we didn't expect. There's a yard, but it's over grown and not really a place our kids wanted to play. The yard is surrounded with nearby houses that aren't well maintained. So if you're looking for a rental with a view, this isn't it. I didn't see many rental options with a ocean view in town - it's primarily hotels and motels. The beach is long and wide in Ocean Shores, so there aren't places "on the beach" per se. The town has plenty of things to do for families. The Family Fun Center (there are two locations) is fun for a few hours. The ice cream spot next door has good ice cream and a gaming room where teens can play the latest Xbox and PS4 games in a cool environment. Check out Yelp for dinner spots. We liked Galway Bay and Home Port. Ten Pines Cottage is a good spot for 4 people for a few nights. My family and I had a great time at Ocean Shores over the Independence Day holiday and that was in part due to our comfortable stay at the Ten Pines Cottage. Minutes from the beach and close to all activities and shopping you can't ask for a better location. 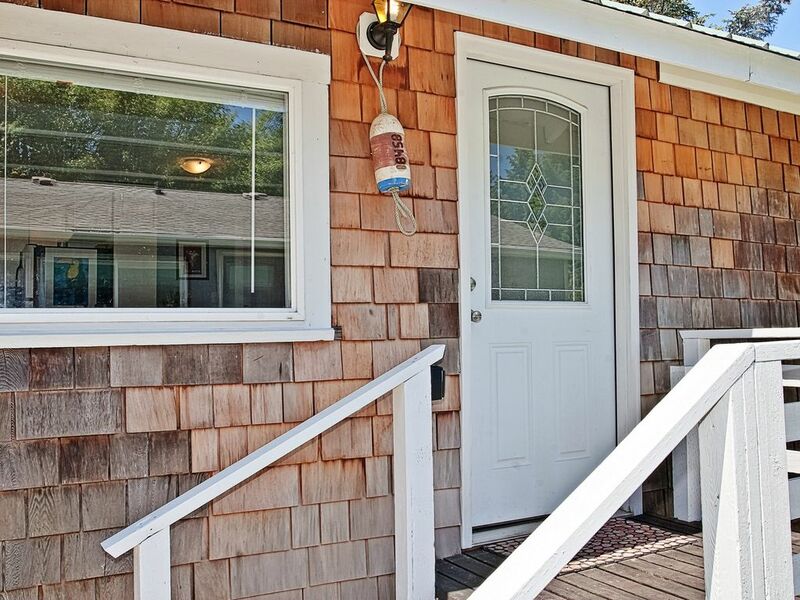 I would rent from Vacations By The Sea again and would stay at the Ten Pines Cottage.